Megjegyzés BATMAN #21-22 and THE FLASH #21-22. The road to DOOMSDAY CLOCK begins here, with the invasion of the Watchmen into the DC Universe! 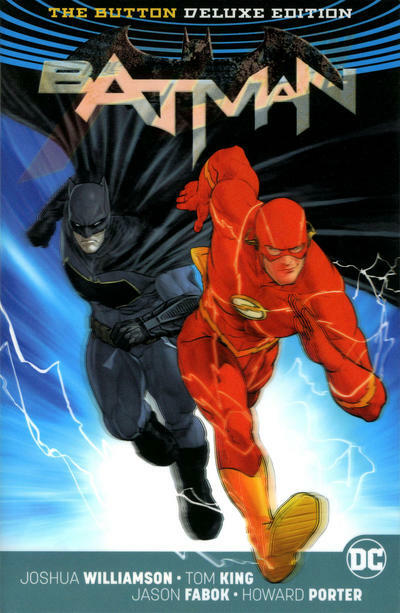 BATMAN/THE FLASH: THE BUTTON DELUXE EDITION is the prelude to this epic story. During the unforgettable events of DC UNIVERSE: REBIRTH, Batman found a mystery he can even begin to solve a strange bloodstained smiley-face button embedded in the Batcave wall. All analysis suggests the button is not of this universe...so where did it come from? And who left it here? These are questions only the Flash can help answer. When the button is stolen by Reverse-Flash, Batman and Flash follow his trail to a parallel world, a twisted alternate timeline that should exist. Someone is sending the heroes on a bizarre trip through reality, showing them glimpses of fallen loved ones and forgotten friends but who? Wally West warned the Flash of an unseen force influencing our world distorting histories, pulling the strings, watching all—and the strange yellow button could be the key to finding it. Featuring the all-star creative team of writers Joshua Williamson and Tom King alongside top-tier artists Jason Fabok and Howard Porter. The road to DOOMSDAY CLOCK begins here!